The Raspberry Pi 2 is now shipping, and you can buy it for the same price as the previous model. And get this: For the first time the mini-computer will support Microsoft’s Windows—specifically, Windows 10 for the development of smart devices and appliances. At $35, the new computer retains the low-cost appeal of the original Raspberry Pi, which has sold more than 4 million units. Raspberry Pi 2 is also six times faster than the original computer. Raspberry Pi 2—which will ship on Monday—is an uncased computer that could be held in one hand, with all the important components on one board. The new computer is the same size as its predecessor, which spawned the development of robots, electronics, gadgets and even a Bitcoin ATM. The Raspberry Pi 2 has a faster CPU and more memory than its predecessor. 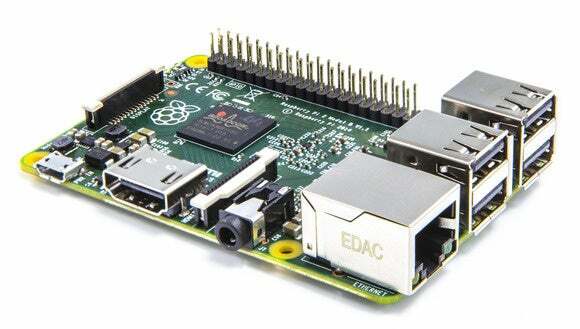 This could make it a true PC replacement, said Eben Upton, founder of Raspberry Pi Foundation. “This is obviously fantastic news for Raspberry Pi—in terms of performance it takes us over the line into being a ‘real’ PC you could use for web browsing and productivity applications,” Upton said. The faster performance will also bring new applications like computer vision to robots, smart devices, drones and other electronics. For example, the extra horsepower will allow the Pi 2 to comprehend images from attached 3D cameras, which was not possible on Pi 1. The Raspberry Pi 2 could also improve the agility of robots and drones through faster calculations. The computer will also be faster at processing sensor data. “I’m just incredibly excited what people are going to do...in particular in the maker community,” Upton said. Raspberry Pi 2 will support Linux-based Raspian OS, but Raspberry Pi also worked with Microsoft to bring Windows for the first time to the computer, Upton said. Raspberry Pi 2 will support a customized version of Windows 10 for embedded devices. Users will be able to use Raspberry Pi 2 to develop Windows-based smart devices, robots and appliances. Microsoft is looking to expand in the Internet of Things market and offers development boards like Intel’s Galileo and Galileo 2 as part of its Windows on Devices program. Raspberry Pi 2 may become part of that program. Raspberry Pi 2 won’t run a full edition of Windows 10, or allow access to applications like Internet Explorer or Office. Instead, developers can use the command-line interface to develop and prototype IOT devices. Windows wasn’t an option for the original Raspberry Pi in 2012 because the computer was too slow, Upton said. The speed boost made it feasible to put Windows on Raspberry Pi 2, and Microsoft quickly whipped up a version of Windows 10 for the device, Upton said. Windows 10 brings some unique things to Raspberry Pi 2 in the areas of device updating and system security, Upton said. Microsoft has talked about a version of Windows 10 code-named Athens for power-, cost- and size-constrained devices. The OS will be developed for both ARM and x86 processors. The original Raspberry Pi, which started shipping in 2012 and was priced from $25 to $35, became popular for its sheer versatility. One of its most popular uses was as a home media server with XBMC, with the computer serving movies and shows to TVs. It was also used by programmers to test Linux applications and by students to learn programming. But Pi’s popularity ended up hurting it the most. Many users clamored for an upgrade to its aging CPU and components. Some users moved over to faster boards with better graphics. Component prices have come down, which made it possible to build the faster Raspberry Pi 2 in the same price range as its predecessor, Upton said. The biggest upgrade in the Raspberry Pi 2 is the CPU, which provides much faster processing power. It has a quad-core ARM Cortex A7 CPU, which is used in many smartphones today. At 900MHz, the CPU speed isn’t blistering, but it will capably run a Linux distribution with a browser and a productivity application like LibreOffice, Upton said. It has a Broadcom VideoCore IV graphics processor, which will be able to render 1080p video. It will be also possible to play basic 3D games with support for OpenGL ES 2.0. The computer has 1GB of RAM, which is double that of the original Raspberry Pi. The new computer is also backward compatible with the original Raspberry Pi, which was important to Upton in developing the board. That will ensure electronics made for the original Raspberry Pi will work with the new computer. Applications will also be cross-compatible. Otherwise, components on Raspberry Pi 2 are similar to that on older Model B+. It has four USB ports, an HDMI outlet, an ethernet slot, microSD slot for storage and GPIO pins. Raspberry Pi Foundation will retain the original models that shipped in 2012, including the $35 Model B+ and Model A+, which is now to be priced at around $20.